In early fall, members of the 2018 Global Sustainability Fellows (GSF) cohort gathered to present a design strategy for the future of the GSF. 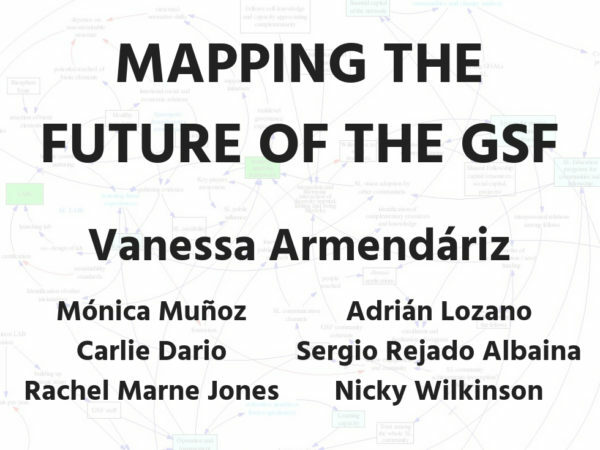 During the 2018 GSF session, Vanessa Armendariz, a GSF faculty member and alumna, led a group of six fellows through the task of mapping the future of the GSF and expanding the network and reach of the program. The group gathered to present their preliminary results at a meeting with Lab staff and GSF faculty. During the conversation, they detailed their plans and ideas for the future of the program, and how the GSF can be used to further The Lab’s mission of fostering change. This discussion highlights one unique aspect of the GSF: the involvement of the cohorts in teaching and further design of the program. The GSF has evolved significantly since its pilot sessions in 2014 and 2015, and the 2018 session, conducted at the Arava Institute for Environmental Studies in Israel, marked the first program executed since the pilots. Vanessa and her team of 2018 fellows will finalize their findings in the coming weeks, and we look forward to their plans for the future of the program and the GSF network! Be sure to report back for any and all GSF-related news and announcements on our website and social media channels. You can follow the GSF on Facebook and Twitter for more updates.